Folly Beach robberies, shooting 'worst violence in 60 years' | Crime Stoppers of the Lowcountry: 554-1111 | 1-888-CRIME-SC | Anonymous tips earn cash rewards with Crime Stoppers of the Lowcountry. FOLLY BEACH, SC (WCSC) - Authorities are looking for a man still on the run who is suspected of two armed robberies and a shooting early Sunday morning on Folly Beach. Since the incidents that took place four hours apart, the Folly Beach Public Safety Department says it's the worst case of violence they've seen in decades. "Anything of this magnitude of violence, we haven't seen in 60 years on Folly Beach and it's got us concerned," says Public Safety Chief Dennis Brown. Brown says the first armed robbery took place at 2:30 a.m. on Sunday. The suspect approached a victim at the far East end of Folly Beach near the old Coast Guard station and tried to rob him of his silver Corvette. A struggle ensued and Brown says the suspect shot the victim once in the chest and ran away with his cell phone and money. On the West side of Folly just four miles away, Brown says the same suspect jumped in front of a person on a moped near the Exchange building on West Indian Avenue. After stealing a large amount of money from the second victim, the suspect took off in the woods again. Brown says the second victim got a good look at his assailant and was able to describe him well enough for a sketch. According to information from the victim, the suspect is a white male in his late 20's with a thin beard. At the time of the robberies, the suspect was wearing a black hoodie and dark sweat pants. Since the crimes, the Public Safety Department has been working hard to catch their suspect. Brown says, "We've been searching a lot of places where we have information our suspect may be. We have placed flyers throughout the community, co-coordinating our efforts with other law enforcement agencies to hopefully share some information and identify this gentleman soon." The latest update on the first victim who was shot in the chest is his condition is upgrading. Brown says the situation didn't look good throughout Sunday. The Public Safety Officer says the bullet barely missed the victim's heart and instead punctured his lung. 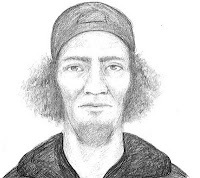 If you've seen the man in the sketch or have any information on either robbery, please call Folly Beach Public Safety at 588-2433.